It mainly consists on preparing small pieces of code that are responsible for testing parts of the real application. For this purpose each of the main programming languages has its own unit testing framework. In the case of PHP this is PHPUnit. Unit testing applications is not a trivial practice. It's not easy pick an existing application and start writing tests for it. There is where Test-driven development comes in. When we are doing TDD every new feature or piece of code we write will come with a test previously written that will fail the first time. Once the failing test is written and we know what the real code is expected to do we will write it. Once it is done the test should pass. Finally we can refactor the code. This is knonwn as red light, green light, refactor. Red light: the test fails the first time. Green light: the test passes after the code is implemented. Refactor: the tested code is refactored to improve performance and make it maintainable. To make it possible to test an application it is better if it is object oriented, and it follows the SOLID principles. PHPUnit can be used to test procedural code, but we are not going to discuss that in this article. Finally we need to get the PHPUnit library. It can be done by following this article. 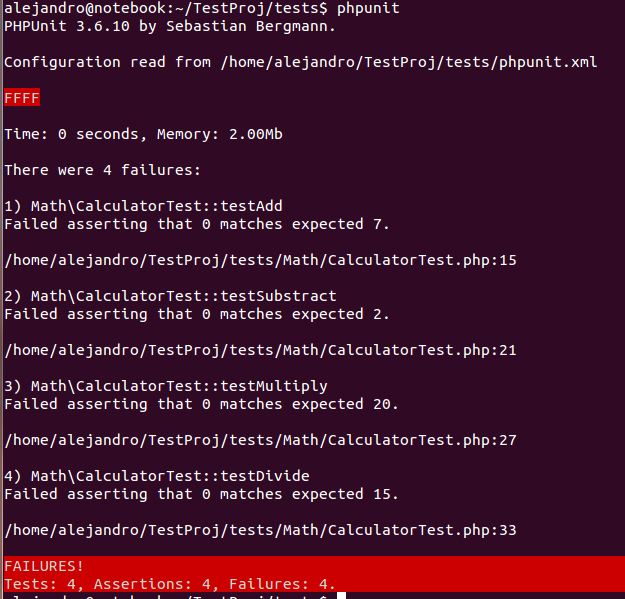 If everything went ok we are now ready to run PHP unit tests from the command line with the phpunit command. Lets asume we need to test a Calculator class, which is used to perform mathematical operations. The first step is to write the empty class that will fail the tests. We know the behavior of the class, but we will avoid the concrete implementation by the moment. Note. It is assumed the classes in these examples can be loaded somehow, by including them or autoloading them. While using PHPUnit, tests are usually classes that extend PHPUnit_Framework_TestCase, so lets define our CalculatorTest class. Each test case class contains some methods which name starts with the test word. Each one of those methods will be called in order of definition by phpunit. There could also be deffined a method called setUp() and a method called tearDown(). Those methods are automatically called previous and later to each test method. To test the application code and check everything is going as expected we will use the assertion methods. There is a bunch of them that can be used to compare results with whatever we are expecting to be produced. For example, the method assertEquals($expected, $actual) will check both $expected and $actual are equals. If they are the test will pass, if not the test will fail. As we can see, the behavior of Calculator class has been assumed while writing the test, but as the class is not implemented, the tests will fail. Running the tests for the first time. Red light. To run a PHPUnit test suite, a small configuration script has to be defined. It is a xml script that PHPUnit will read to know how to run the tests. We will define on it the test classes and a so called bootstrap script, which is a php script that is runned after all the test cases to perform any operation needed for the code to work, like load configuration, set up autoloaders, loggers, database connections (not recommended, we will see this latter) and such. A basic phpunit.xml file will look like this. This is defining the boostrap.php script is located in the same directory and that we only have one test suite called Math that will look for any class called *Test in the Math directory. We could add more testsuites if we had more tests, and test results will be grouped for each testsuite. In our case the bootstrap.php script does simply define how to load classes, but it could be as complex as we need. With all this set up we are ready to run the tests. In the console we need to be at the tests directory and run the phpunit command. It will find the phpunit.xml script and run the tests as we configured them. As we can see all the tests failed. They all returned zero instead of expected result. Finally a resume line tells there were 4 tests, 4 assertions and all of them failed. Now we are ready to implement the calculator methods. Running the test again. Green light. The Calculator class methods should now be implemented, like this. All the methods do now what they suggest they do. If we run again the tests with the phpunit command the result is this. All the tests are now working and a green light is returned. We could now refactor the code. In our example it has no point because every method is a one line. You should have noticed that divide() method could throw an exception if we try to divide by zero. PHPUnit allows us to test if an exception is produced while running some piece of code. To do this we could update our CalculatorTest class adding a new test like this. We just added an @expectedException annotation, telling PHPUnit what kind of exception will be produced in that method. If that exception is produced, the test passes, otherwise it is considered it has failed. Now that we have our tests working it's time to go a step further. The Calculator class is a very simple class with no dependencies, but in real world it is common to have some dependencies that could difficult to test the class. For example, we could have a component that sends emails, or consumes a web service, are writes into a database. All of this operations have to be avoided at testint environments. We don't want to test if we have a proper internet connection, or we have configured the database in the wrong port. For this purpose the mocks are introduced. They are fake objects designed to replace a real object that is used in production and development environments, but we want to avoid at this point. In PHP there is plenty of libraries to create mocks at runtime, but I prefer to write them by implementing interfaces. If we program always to abstractions, our dependencies will always be interfaces, and any object implementing them will be valid, the real pbject at production environment and the mock at testing environment. For example, imagine our Calculator class has to send all calculation results to a web service before returning the result, and we have a class called WebRegister with the implementation of calling to that web service and sending the information. We could make it to implement a so called WebRegisterInterface that will be lately used to create a WebRegisterMock. Now we will update the Calculator class to get its dependency injected in the constructor. Now, the result is sent every time a calculation is performed. This refactoring will force us to update the CalculatorTest, because we instantiate a Calculator object there with no arguments. That will produce a PHP error because of the missing argument, but we donÂ´t want the web service to be called every time we run the test. Now we can run tests again and all lights will be green. This is basically what unit testing is. In real life testing use to be a little more complex, with more dependencies and more code to be written. We should also add some more assertions for each operation, to ensure everything is ok, but this is just an example. For a complete PHPUnit documentation refer to its website.